Jane Schmidt did not realize her grandfather was one of several people featured in Wisconsin Veterans Museum display chronicling the untold stories of those who served in World War I until her father received a phone call. Schmidt, a library reference assistant at the Burlington Public Library, remembered when her family learned about the revelation. “About a year ago, somebody contacted my dad in Shawano and said they were at the Wisconsin Veterans Museum in Madison and indicated there was this life sized picture of your dad and we knew nothing about it,” she said. The Wisconsin Veterans Museum, which created both a permanent and traveling display, launched the exhibit titled “WWI Beyond the Trenches: Stories from the Front” last April as part of the war’s 100th anniversary. The display is a first for the museum using a story-based approach drawing on its substantial oral history collection and archives to share stories of military members. “Between the United States entering the First World War on April 6, 1917, and the armistice on Nov. 11, 1918, more than 122,000 Wisconsin men and women served, each contributing to the final victory in their own way,” Wisconsin Veterans Museum Director Michael Telzrow said in announcement. 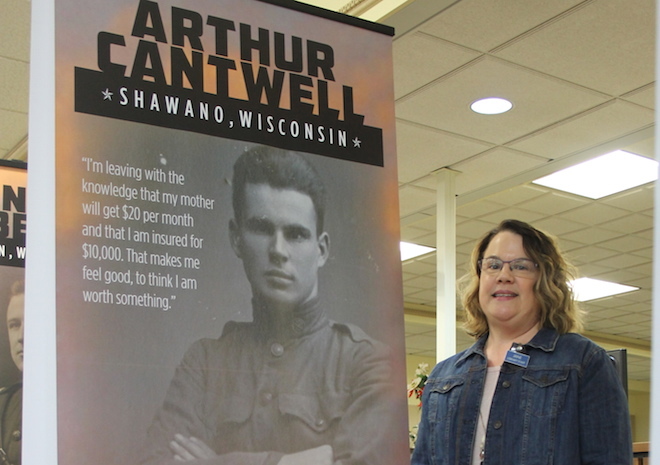 Meanwhile, Schmidt and her family became intrigued, so she called the Veterans Museum last summer and decided to visit the permanent display honoring her grandfather, Arthur Cantwell. Schmidt, originally from Shawano, was joined by her parents, William and Cassy, along with brothers Bill and Curtis. She said it was a memorable experience. “It was really special to be there,” she said. To read the entire story, including how her grandfather went on to be a well-known doctor in Northeast Wisconsin, see the Feb. 7 Burlington Standard Press.